Heinrich Georg Barkhausen was German physicist who discovered the Barkhausen effect, a principle concerning changes in the magnetic properties of metal. Heinrich Barkhausen attended the universities of Munich and Berlin before earning his doctorate in 1907 from Göttingen. After working for the Siemens & Halske laboratories in Berlin, he accepted the world’s first professorship in the communications branch of electrical engineering, at the Technical Academy in Dresden (1911). There he worked on theories of spontaneous oscillation and nonlinear switching elements and formulated electron-tube coefficients that are still in use. He also experimented with acoustics, proposing methods for the subjective measurement of loudness. Barkhausen’s work in acoustics and magnetism led to the discovery in 1919 of the Barkhausen effect, which provided evidence that magnetization affects whole domains of a ferromagnetic material, rather than individual atoms alone. Barkhausen effectis series of sudden changes in the size and orientation of ferromagnetic domains, or microscopic clusters of aligned atomic magnets, that occurs during a continuous process of magnetization or demagnetization. The Barkhausen effect offered direct evidence for the existence of ferromagnetic domains, which previously had been postulated theoretically. Heinrich Barkhausen discovered that a slow, smooth increase of a magnetic field applied to a piece of ferromagnetic material, such as iron, causes it to become magnetized, not continuously but in minute steps. The sudden, discontinuous jumps in magnetization may be detected by a coil of wire wound on the ferromagnetic material; the sudden transitions in the magnetic field of the material produce pulses of current in the coil that, when amplified, produce a series of clicks in a loudspeaker. These jumps are interpreted as discrete changes in the size or rotation of ferromagnetic domains. Some microscopic clusters of similarly oriented magnetic atoms aligned with the external magnetizing field increase in size by a sudden aggregation of neighbouring atomic magnets; and, especially as the magnetizing field becomes relatively strong, other whole domains suddenly turn into the direction of the external field. 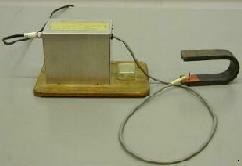 In order to observe the Barkhausen effect, a metal core is inserted into a small probe consisting of a coil of wire. The probe is held parallel with the field of a horseshoe magnet. When the probe is flipped 180 degrees, a crackle can be heard over the sound system. The crackle is the flipping of the magnetic domains within the core. The core consists of either copper, soft iron, or steel. # Evaluation of residual stresses; provided microstructural variables can be reasonably controlled. # Evaluation of microstructural changes; provided level of stress can be reasonably controlled. # Testing of the following surface defects, processes and surface treatments that may involve changes in both stresses and microstructure: (a) Detection of grinding defects and grinding process control; (b) Detecting surface defects through Cr-coating; (c) Evaluation of shot-peening effect in steel; (d) Measurement of residual surface stresses in steel mill rolls and steel sheet. 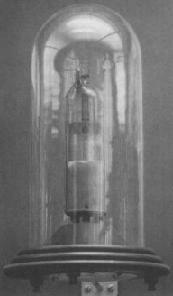 In 1920 Barkhausen developed, with Karl Kurz, the Barkhausen-Kurz oscillator for ultrahigh frequencies (a forerunner of the microwave tube), which led to the understanding of the principle of velocity modulation. Heinrich Barkhausen is also known for experiments on shortwave radio transmissions.